Sign Up for Child Care at MongoDB World 2017 | MongoDB Hurry, ticket prices for MongoDB World increase on March 3! As part of our mission to make MongoDB World accessible to all who want to attend, we’re proud to announce we’re offering childcare at MongoDB World, June 20-21 in Chicago. The child care center will be available 9:00am - 5:00pm on June 20-21. It will be located onsite at the conference venue, next to our nursing room for new mothers. For the subsidized rate of $50 per child you can bring your children along to MongoDB World. The deadline to sign up for child care is May 19, 2017. Availability is limited, so reserve your spot today. The childcare center will be staffed by licensed professionals who are both Infant and Child CPR certified, First Aid certified, background checked, and trained to care for children ages newborn to 17 years. Children will be provided toys and will be able to participate in arts and crafts, group games, and team challenges. They will be entertained and engaged through the event, and when you pick them up, they’ll have a little handmade gift for you. 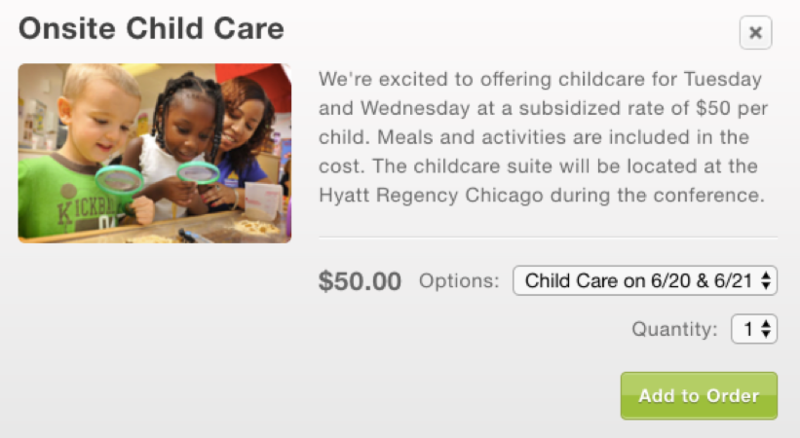 When you register for MongoDB World, check the box next to the question Will you need child care at the event? At the bottom of the registration form, in the Additional Items section, select Onsite Child Care. Select the number of children you’d like to enroll (open to children ranging from 6 weeks to 13 years old). And select Add to Order. Hurry, ticket prices for MongoDB World increase on March 3!